The costs of regime-threatening sanctions on North Korea might outweigh the benefits. This article was first published at 38 North, a blog of the U.S.-Korea Institute at Johns Hopkins SAIS. It is republished with kind permission. A recent op-ed by Sung-Yoon Lee and Joshua Stanton highlights what should happen in dealing with North Korea. Unfortunately, for this long-time practitioner in the field of nonproliferation sanctions, it also highlights what cannot happen — or at least what cannot happen at an acceptable level of risk with the limited knowledge and the complex agendas that policymakers face. At the highest level of analysis, Lee and Stanton get some key points right. The effort of multiple U.S. administrations to negotiate away the threat of North Korean nuclear weapons has been a truly bipartisan failure. Four U.S. presidents — two of each party — have tried and yet it seems the story of failure repeats itself in very familiar ways. However, the authors certainly over-simplify the story of those efforts. It is worthy of note that the four administrations came at the problem from very different perspectives and initially tried tactics that ranged from highly confrontational to being predisposed to engagement. Yet all ended up more or less in the same policy dead-end. This might lead one to suspect that the problem with North Korean policy might not rest primarily with naiveté in Washington but rather with a single-minded Pyongyang that has a very limited diplomatic repertoire. Lee and Stanton are correct that it is extremely unlikely that any set of negotiated incentives will ever induce the DPRK to give up its nuclear weapons. They are probably also correct that — if North Korea were to be coerced into giving up its weapons — it would require regime-threatening measures to be put into play. But, that does not mean that such measures can be created at this time. Moreover, it does not mean they should be implemented unless a careful calculation of the costs and benefits can be made. For example, in their column, Lee and Stanton propose that the U.S. and others “block the Kim Jong-un regime’s offshore hard currency reserves and income with financial sanctions, including secondary sanctions against its foreign enablers. This would significantly diminish, if not altogether deny, Kim the means to pay his military, security forces, and elites that repress the North Korean public.” For the practitioner, this statement is a laudable goal, but the devil is very much in the details. First, the statement assumes there is a vast flow of funds and foreign reserves to be seized. This is not the case, or at least there is no confirmed knowledge of such flows. North Korea has great difficulty moving money in the international financial system due to existing U.S. and UN sanctions. Lee and Stanton cite reports of a North Korean slush fund that might amount to $1 billion. This is hardly enough to endanger a regime — even one with the paltry foreign exchange flows of the DPRK. Pyongyang can always squeeze what it needs out of the DPRK’s economy to take care of its most important supporters, even if the rest of the population starves. While previous seizures of relatively modest sums in cases like the Banco Delta Asia case did affect and infuriate the DPRK leadership, it is an urban myth that these financial measures were about to topple the regime. But the main problem is that there is precious little knowledge of North Korean foreign exchange holdings. We can’t effectively target the regime’s finances because our knowledge is insufficient to do so. In part, this is an unfortunate side effect of successfully driving North Korea out of the formal international financial system through past sanctions. Second, the largest flow of funds available to the regime does not come from illicit weapons sales or other sanctioned activities; it comes from aid, trade, and investment from Beijing (and to a smaller extent, South Korea). The activities receiving funding have no direct relation to proliferation. One could design unilateral U.S. sanctions that could create a trade and investment embargo on North Korea through secondary sanctions. One could, for example, ban any entity from the U.S. banking system if it invested in key areas of the North Korean economy, such as mining or light manufacturing. The same could be done for the supply of petroleum to the DPRK. This would indeed create the sort of regime-threatening pressure that Lee and Stanton suggest. But, enforcing such sanctions and achieving the effect we would want at a cost the American people could afford is not a given. The first problem would be to deal with work-arounds. The Chinese are quite adept at identifying entities that have little or no exposure to the U.S. or global financial system and designating them to take on activities in zones with risk of U.S. sanctions. Unilateral sanctions could end up delivering far less than we hoped, forcing sanctions implementers to continuously up the ante with China to get the desired impact. If there were a way to multilateralize sanctions via the UN, this problem could be solved, but that seems unachievable. The second and more serious problem is if the Chinese chose not to use work-arounds but rather refused to comply with unilateral U.S. sanctions. While the Chinese do comply with the letter of UN sanctions, they have always made clear unilateral U.S. sanctions are not legitimate in Beijing’s eyes. Sometimes the Chinese find creative ways of dealing with unilateral sanctions when they see their own interests as parallel to the United States’. This might not be the case if Washington tried to force a major change in Chinese policy on Korea. If major players in the Chinese financial system are exposed to U.S. sanctions, people have to consider what happens to the U.S., Chinese and global economies if sanctions are applied. Over the past two weeks, the Chinese and U.S. investment markets have demonstrated a rather strong psychological link. Panic in China has been contagious — perhaps more than pure economic fact could justify. Our financial markets have an even stronger and more real link. At a time when those markets appear to be very skittish and the probability of a U.S. recession is the highest it has been in five years, it might not be the wisest course to start an economic war without thinking things through. This is not to say it is not time to make clear to Beijing that on both the security and economic fronts Pyongyang’s nuclear program is creating more costs than benefits for the PRC. But it is a plea for the use of tools a bit more subtle than legislated unilateral U.S. sanctions can be. “Regime-threatening sanctions” are very blunt and powerful instruments. Think, for example, of the sanctions placed on Iraq after Saddam Hussein’s invasion of Kuwait. They are final cards to be played before diplomacy ends and other bloodier means are employed to solve problems. It may not be wrong to let others know that such a card could be played, but it would be wise not to play it frivolously. There are several ways the Obama administration might begin to open the door to much tougher sanctions on the DPRK without playing Russian roulette with the global economy or possibly with peace on the Korean peninsula. The best, in theory, would be a diplomatic campaign that would move Beijing toward much tougher UN sanctions. Without knowing the state of play of U.S.-PRC diplomatic discussions on this topic, it is hard to say how promising this route might be. At best, it would take a long time and at worst it would end up with results as disappointing as past efforts in this area have been. In any case, it is certain this topic will be explored in New York and in capitals. Another approach might be for the administration to use existing sanctions or those that will become available to it once HR 757 becomes law. Perhaps the sanctions experts in the U.S. Treasury, Department of State, or the intelligence community are aware of a Chinese entity that is: a) violating U.S. sanctions on North Korea, and b) is clearly generating significant amounts of foreign exchange for the regime. This might create the opportunity for a diplomatic test case. Rather than leaping into triggering sanctions, the administration could use the case as a means to see if it is possible to coordinate quietly with Beijing on a pressure campaign against Pyongyang. One would presume the Chinese would have their own expectations (possibly about reinvigorating a diplomatic track with Pyongyang and certainly about ensuring U.S. sanctions do not make an already touchy macroeconomic environment in China any less stable). But this would not be the first time the U.S. and PRC engaged in such delicate choreography in the context of nonproliferation sanctions. Joseph M. DeThomas is a Professor of Practice in the School of International Affairs of the Pennsylvania State University. He previously served as U.S. Ambassador to Estonia from 2001 to 2004, and spent 32 years working in the U.S. Department of State. North Korea's 5th Nuclear Test: How Will the World Respond? 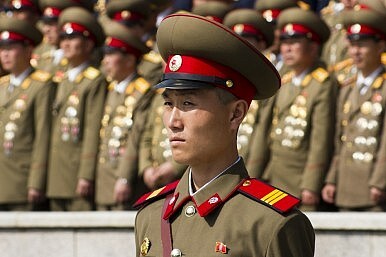 The Kim regime is counting on more of the same from the international community.